From the April 16, 1862, issue of The Prescott Journal comes this article on what will be known as the Battle of Shiloh, but was called Pittsburg Landing at first. The Union Army under Ulysses S. Grant had moved deep into southern Tennessee and was encamped at Pittsburg Landing on the west bank of the Tennessee River. Confederate Generals Albert Sidney Johnston (who was killed at Shiloh) and P. G. T. Beauregard launched a surprise attack, achieving considerable success on the first day (April 6) of the two-day battle. Grant’s counter-offensive on April 7 overpowered the Confederate forces and Beauregard’s army retreated to Corinth. 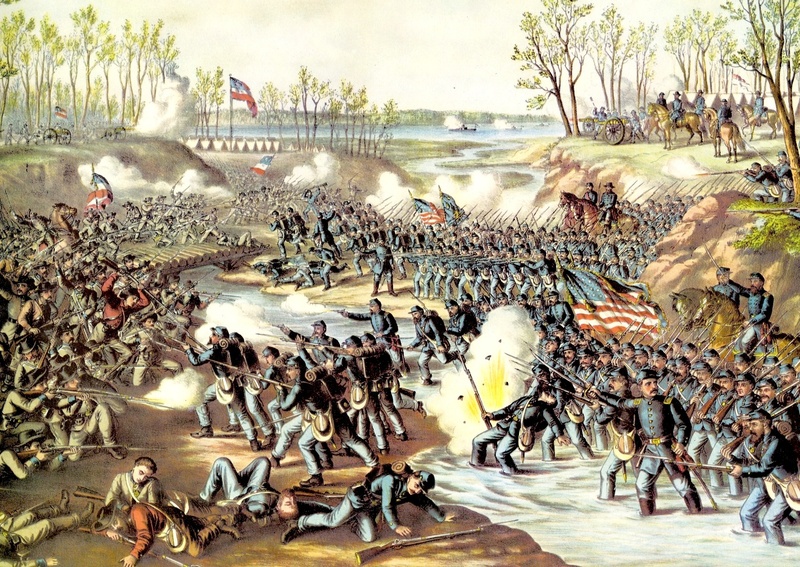 The battle was the bloodiest to date in the Civil War. Also see the account of the battle in an April 30 posting, and accounts of the Wisconsin regiments in the battle (April 23 and April 30). One of the greatest and bloodiest battles of modern days has just closed; resulting in the complete rout of the enemy who attacked us at daybreak on Sunday. The battle lasted without intermission during the entire day, and was again renewed on Monday morning and continued until 4 o’clock in the afternoon, when the enemy commenced their retreat and are still flying towards Corinth pursued by a large force of our cavalry. The slaughter on both sides is immense. We have lost in killed, wounded and missing, from 18,000 to 20,000 ; that of the enemy is estimated at from 35,000 to 40,000. It is impossible in the present confused state of affairs to ascertain any details. I therefore give you the best account possible from observation, having passed through the storm of action during the two days that it raged. The fight was brought on by a body of three hundred of the 25th Missouri regiment, of Gen. Prentiss’ [Benjamin M. Prentiss] division, attacking the advance guard of the rebels, which were supposed to be the pickets of the enemy in front of our camp. The rebels immediately advanced to General Prentiss’ division on the left wing, pouring in volley after volley of musketry and riddling our camp with grape, canister and shell. Our forces soon formed into line and returned their fire vigorously. By the time we had prepared to receive them they had turned their heaviest fire on the left and center of Sherman’s division and drove our men back from their camps and bringing up a fresh force opened fire on our left wing under Gen. McClernand [John A. McClernand]. This fire was returned with terrible effect and a determined spirit by both infantry and artillery along the whole line for a distance of over four miles. Gen. Hulburt’s [Stephen A. Hurlbut] division was thrown forward to support the center, when a desperate conflict ensued. The rebels were driven back with terrible slaughter, but soon rallied and drove back our men in turn. From about 9 o’clock, the time your correspondent arrived on the field, until night closed the bloody scene, there was no determination to yield the struggle. The rebels exhibited remarkable good generalship at the time, engaging the left with apparently their whole strength, they would suddenly open a terrible and destructive fire on the right or center.—Even our heaviest and most destructive fire on the enemy did not appear to discourage their solid columns. The fire of Major Taylor’s Chicago Artillery raked them down in scores, but the smoke wo’d [would] no sooner be dispersed, than the breach would again be filled. The most desperate firing took place late in P.M. The rebels knew that if they did not succeed in whipping them, that their chances for success would be extremely doubtful, as a portion of Gen. Buell’s [Don Carlos Buell] forces had by this time arrived on the opposite side of the river, and the other portion was coming up the river from Savannah. They became aware that we were being reinforced, as they could see Gen. Buell’s troops from the river banks, a short distance above us on the left, from which point they had forced their way. At five o’clock the rebels had forced our left wing back so as to occupy fully two-thirds of our camp, and were fighting their way forward with a desparate [sic] degree of confidence in their efforts to drive us into the river, and at the same time heavily engaged our right. Up to the time we had received no reinforcements. Gen. Lewis Wallace [Lew (Lewis) Wallace] failing to come to our support until the day was over, having taken the wrong road from Crump’s Landing, and being without other transports that those used for quartermasters and commissary stores which were too heavily laden to ferry any considerable number of General Buell’s forces across the river, those that were here having been sent to bring the troops from Savannah. We were therefore contesting against fearful odds, our forces not exceeding 38,000 men, while that of the enemy was upwards of 60,000. Our condition at this moment was extremely critical, large numbers of men panic struck, others worn out by hard fighting, while the average per centage [sic] of skulkers had straggled towards the river and could not be rallied. Gen Grant and staff, who had been recklessly riding along the lines during the entire day, amid the unceasing storm of bullets, grape and shell, now rode from right to left, inciting the men to stand firm until our reinforcements could cross the river. Col. Webster, chief of staff, immediately got into position the heaviest pieces of artillery, pointing on enemy’s right, while a large number of the batteries were planted along the entire line from the river bank to our extreme right, some 24 miles distant. About an hour before dusk a general cannonade was opened upon the enemy from along out whole line with a perpetual crack of musketry. Such a roar was never heard on this continent. For a short time the rebels replied with vigor and effect, but their return shots grew less frequent and destructive, while ours grew more rapid and more terrible. The gunboats Lexington and Tyler, which by a short distance off, kept raining shell on the rebel hordes. This last effort was too much for the enemy, and ere dusk the firing had nearly ceased, when, night coming on, all the combatants rested from their awful work of blood and carnage. Our men rested on their arms in the position they had at the close of the fight, until the forces under Major General Wallace arrived and took position on the right, and met Buell’s forces from the opposite side, and Savannah being now converted to the battle ground, the entire right of General Nelson’s [William “Bull” Nelson] division was ordered to form on the right, and the forces under Gen. Crittenden [Thomas L. Crittenden] were ordered to his support early in the morning. Gen. Buell having arrived, in the morning the ball was opened at daylight, simultaneously by Gen. Nelson’s division on the left, and Maj. Gen. Wallace’s division on the right. Gen Nelson’s force opened a most galling fire and advanced rapidly as they fell back. The fire soon become general along the whole line and began to tell with terrible effect on the enemy. Generals McClernand’s, Sherman’s, and Hulbut’s [sic] men though terribly jaded from the previous days fighting, still maintained their honors won at Donelson but the resistance of the rebels at all points was terrible and worthy a better cause, daunted bravery and the dreadful destruction produced by our artillery which was sweeping them away like chaff before the wind. But knowing that a defeat here would be a death blow to their hopes and that their all depended upon this great struggle, their Generals still urged them on in the face of destruction, hoping by flanking us on the right to turn the tide of the battle. Their success was again for a time cheering as they began to gain ground on appearing to have been reinforced, but our left under Gen. Nelson was driving them with wonderful rapidity, and had succeeded in flanking them, and capturing their batteries of artillery. They however again rallied on the left and recrossed, and the right forced themselves forward in another desperate effort, but reinforcements from Gen. Wood and Gen Thomas were coming in regiment after regiment, which were sent to Gen Buell, who again commenced to drive them. About 3 P.M. Gen. Grant made to the left where the fresh regiments had been ordered, and finding the rebels wavering sent a portion of his bodyguard to the head of each regiment, and them ordered a charge across the field, himself leading. As he brandished his sword and waved them on to the crowning victory, the cannon balls were falling like hail around him. The men followed with a shout that sounded above the roar and din or artillery, and the rebels fled in dismay, as from a destroying avalanche, and never made another stand. Gen. Buell followed the retreating rebels, driving them in splendid style, and by half past 5 o’clock the whole rebel army was in full retreat to Corinth, with our cavalry in hot pursuit, with what further result is not known not having returned up to this hour. We have taken a large amount of their artillery and also a number of prisoners, we lost a number of our forces prisoners yesterday, among who is Gen. Prentiss. The number of our forces taken has not been estimated yet. It is reported as several hundred. General Prentiss is also reported wounded. Among the killed on the rebel side was their General in Chief, Albert Sidney Johnston, who was struck by a cannon ball on the afternoon of Sunday. Of this there is no doubt, as the report is corroborated by several rebel officers taken to-day. It is further reported that Gen. Beauregard had his arm shot off this afternoon. Gens. Bragg [Braxton Bragg], Breckenridge [John C. Breckinridge], and Jackson were in command of portions of the rebel force. Brigadier General W. S. Wallace [W.H.L. Wallace], killed; Col. Pegram, acting General, Killed; Col. Ellis, 10th Illinois, and Major Goddard of the 15th Illinois, killed; Lieut. Col. Gorfield of the 12th Ohio, mortally wounded, since died; Lieut. Col. Kyle of the 41st Indiana, mortally wounded; Col. Davies of the 46th Illinois, mortally wounded. Gen. Sherman [William T. Sherman] was wounded in the head by a cannon ball. Col. Sweney of the 52nd Illinois, acting Brig. General, wounded, received two shots in his only arm, having lost one in Mexico, also a shot in one of his legs. Col Sweney kept the field until the close of the fight, and he excited the admiration of whole army. Col. David Stuart, 55th Illinois, acting Brigadier General, shot through the breast on Sunday, returned to the field on Monday. Capt. Irving W. Carson, Gen Grant’s scout, had his head shot off by a cannon ball. Capt. Preston Morton was wounded mortally and has since died. Capt. Dillion on the 18th Illinois, killed. Capt. Mace of the 15th Illinois, Capt. Carter of the 11th Illinois, and Major Page of the 57th Illinois, killed. There has never been a parallel to the bearing and gallantry of our officers, from the commanding General to the lowest officer. Gen. Grant and staff were in the field riding along the lines in the thickest of the enemy’s fire during the entire two days of the battle, and all slept on the ground on Saturday night during a heavy rain. On several occasions he got in range of the enemy’s guns, and was discovered and fired on. Lieut. Col. McPherson having his horse shot from under the alongside of Gen. Grant. Capt. Carson was between General Grant and you correspondent when a cannon ball took off his head and killed and wounded several others. General Sherman had two horses killed under him. Gen. McClernand shared like dangers, also Gen. Hurlbut, each of whom received bullet holes through their clothes. Gen. Buell remained with his troops the entire day, and with Gens. Crittenden and Nelson rode continually along the lines, encouraging the men. Gen Buell’s advance will probably return from Corinth to-morrow evening. The enemy attacked us a 4 o’clock on Sunday Morning—the brigades of Generals Sherman and Prentiss being first engaged. The attack was successful. Our entire force was driven back to the river, where the advance of the enemy was checked by the fire from the gunboats. Our force was increased by the arrival of Gen Grant with troops from Savannah, and inspired by the report of the arrival of two divisions of Gen. Buell’s army. Our loss this day was heavy. Besides the killed and wounded, it embraced out camp equippage [sic] and 36 field guns. Next morning, our forces, now amounting to 80,000 men, assumed the offensive, and by two o’clock P.M. had retaken our camp and batteries together with some 40 of the enemy’s guns, and a number of prisoners, and the enemy were in full retreat, pursued by our victorious force. Casualities [sic] are numerous. Gen. Grant was wounded slightly in the ankle. Gen Wallace was killed and General Smith [Charles F. Smith] severely wounded. Col. Hall of the 16th Illinois was killed; Cols. Logan of the 32nd Illinois, and Davis of the 51st Illinois, wounded severely; Major Hunter of the 32nd Illinois, killed. Col. Peabody1 of the 15th Wisconsin, was also severely wounded. The wounded and missing are not less than five thousand. In response to a serenade to night, Gen. Halleck [Henry W. Halleck] said that Gen. Beauregard with numerous army had advanced from Corinth and attacked the combined forces of Generals Grant and Buell. The battle began at day break yesterday and continued till late in the afternoon, with terrible loss on both sides. We have gained a complete victory and driven the enemy back within his fortification. He also announced his departure for the field tomorrow morning. Quarters for three thousand additional prisoners at Camp Douglas had been ordered by Gen. Halleck this morning. The Times‘ account of the battle of Pittsburg Landing on Sunday and Monday, says the enemy supprised [sic] General Prentiss’ brigade, which was in advance five miles beyond Pittsburg, at 5 o’clock on Sunday morning, taking two regiments prisoners, including Gen. Prentiss. The fight continued the entire day, the enemy driving our forces back to Pittsburg with fearful loss. Gen. Buell, with Nelson’s division, arrived at four o’clock and turned the tide battles. The enemy, commanded by Polk [Leonidas Polk] and Beauregard, suspended the attack about six o’clock. On Monday morning our troops, having rested on the field, being reinforced by Nelson’s division and supported by the gunboats, drove the enemy back and occupied our former position, immediately followed by several thousand cavalry who at last accounts were some miles beyond Corinth. The Tribune’s dispatch places our losses at from 600 to 1,000 killed, and from 3,000 to 4,000 wounded; the rebel loss twice that number. Six of our batteries were taken and retaken six times. The Times says that Beauregard had given orders not to destroy any camp equipage taken Sunday, as he expected a complete victory next day. 1. No Wisconsin regiment had a Colonel Peabody. The only Wisconsin colonel wounded at Shiloh was Benjamin Allen, from Pepin, colonel of the 16th Wisconsin. Just a thought on the words “do do” as it appears in the list of casualties; “Col. Hagnie 48th Illinois, wounded slightly; Col. J. C. McHenry, 17th Ky. do do; Lieut. Col. Stout 17th Ky. do do; “. My experience has been that “do do” means “dito” or the same as before. So in the above case I believe it means Col McHenry and Lieut. Col Stout were wounded slightly. Thanks, Peter. That’s what I took it to mean, so glad to hear you thought so too.